Finally! 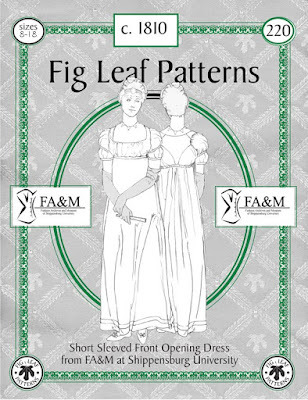 A little more about my part in the c.1810 dress pattern published by Fig Leaf Patterns! In the Spring of 2012 just a year prior to my graduation from Carnegie Mellon's Costume Production MFA program, I began working on my thesis studying methods of creating patterns from originals. As part of the thesis I visited the Fashion Archives and Museum at Shippensburg University under the direction of Dr. Karin Bohleke to study and create patterns from three original garments. The earliest garment was this c.1810 lilac silk dress. I had seen this dress on exhibit at the Fashion Archives and Museum and fell in love with the Grecian inspired knife pleated sleeves and the lovely champagne color (which I later discovered had originally been lilac!). 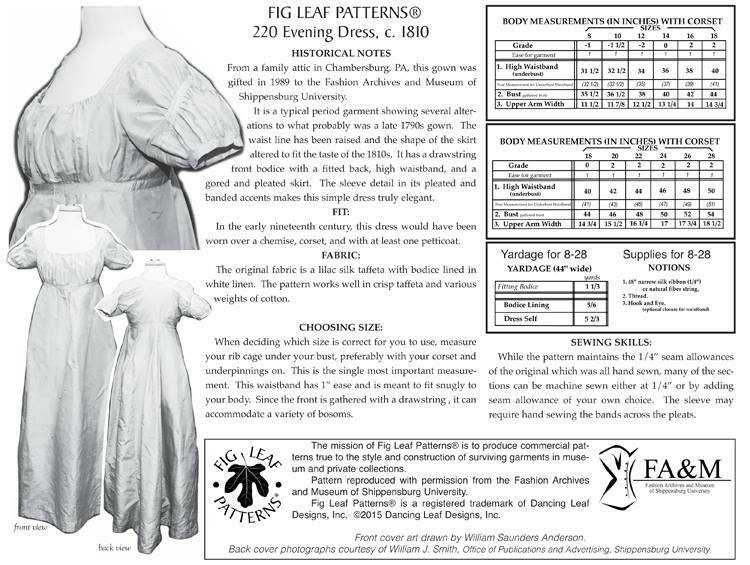 I made many trips to the archives to take the patterns for the three dresses and ensure that they were completely accurate to the original lines of each garment. After completing the patterns I made a reproduction of the c.1810 dress from beautiful lilac silk in the same color as the original (seen in the deepest recesses of the seam allowances) and completed the written portion of my thesis. 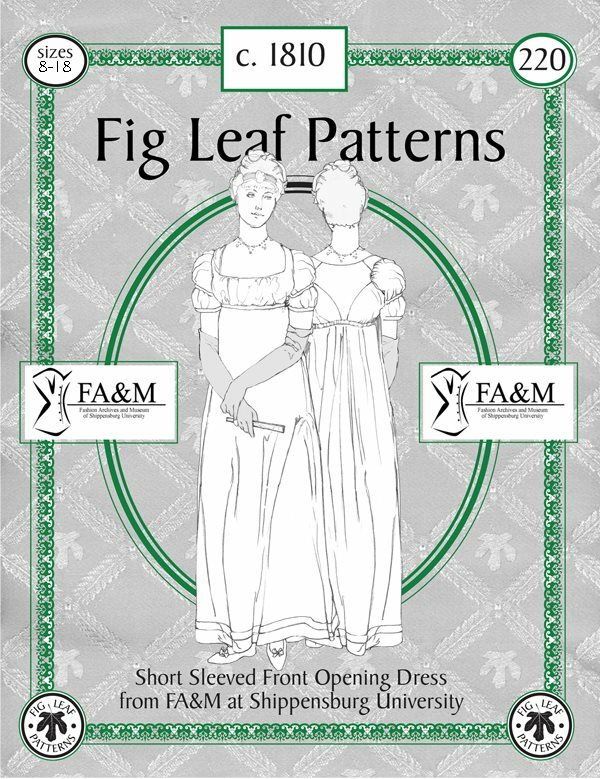 I knew that I wanted the pattern to be available to everyone and had always admired the beautiful patterns created by Mackenzie Anderson Sholtz of Fig Leaf patterns. 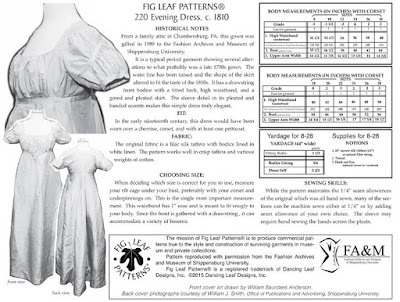 Her directions are always so thorough - complete with instructions on how to alter the pattern pieces for different figure types, detailed images of the original garment and research notes on the garment and others of a similar style. Mackenzie was excited to work with the pattern that I had taken. Even though I had already put many hours into taking the pattern from the original garment there were still many many more hours of work that she would need to put into the process in order for the pattern to be ready to sell. Mackenzie graded the pattern to fit various sizes, wrote directions, and had the pattern tested to ensure that the directions were clear. She did a fabulous job as usual! Now the pattern is finally available for sale! The bodice front closes at the neckline with a drawstring while the under bust is knife pleated onto a waistband that pins closed. The original pin holes were still visible! The skirt is knife pleated onto the waistband at the back with several large pleats and many small pleats at the center back. 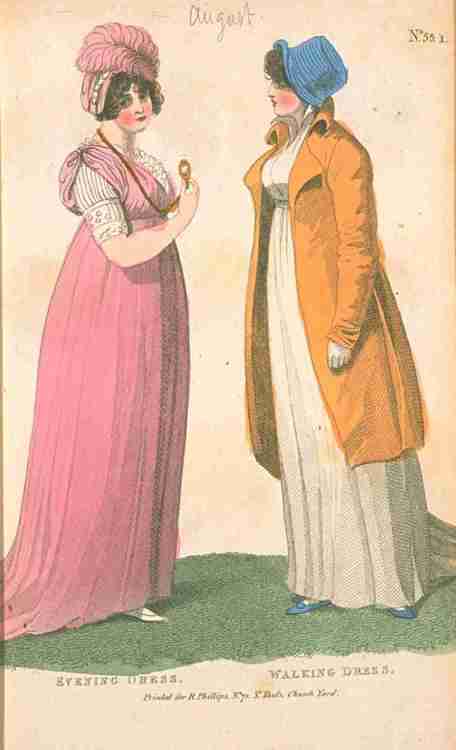 The lining reveals that the bodice was once longer and was altered to keep up with the latest fashions of 1810. 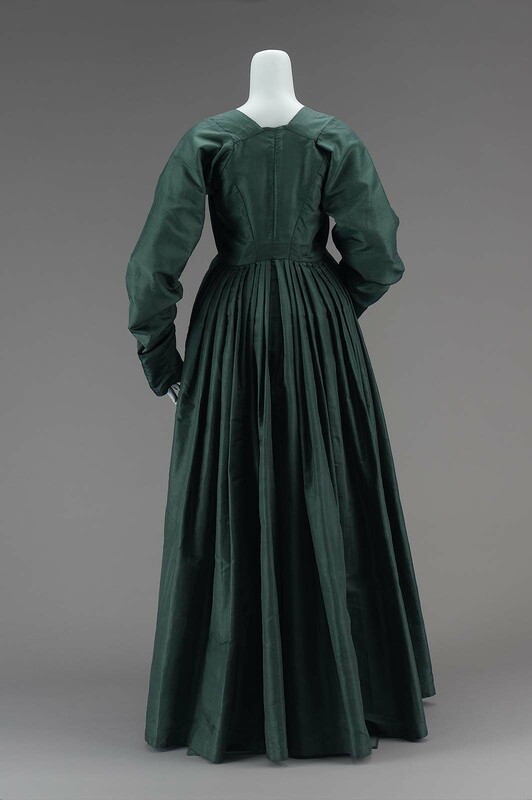 The front lining is also longer, although it had been shortened from the original length so it was not possible to know how long the bodice was in its first version. The front lining is fitted to the body and pins closed. 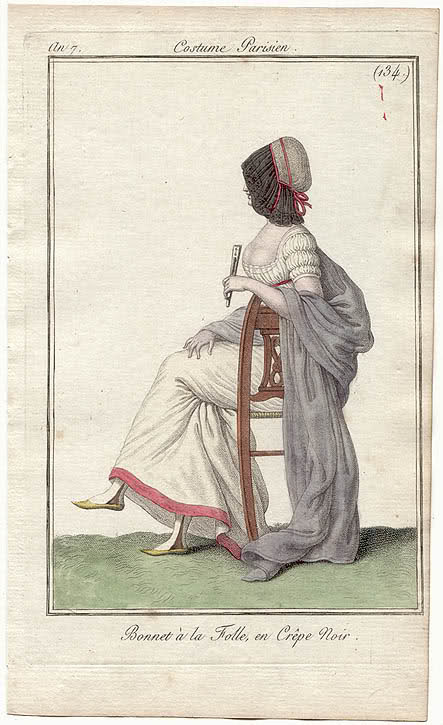 I scoured fashion plates to find images that showed similar sleeve styles to the original garment. These plates also have Grecian inspired sleeves. Silk Dress, Late 1790s, American, MFA Boston. I imagine that the dress when first created had a slightly longer bodice like this late 1790s dress from the Museum of Fine Art in Boston. 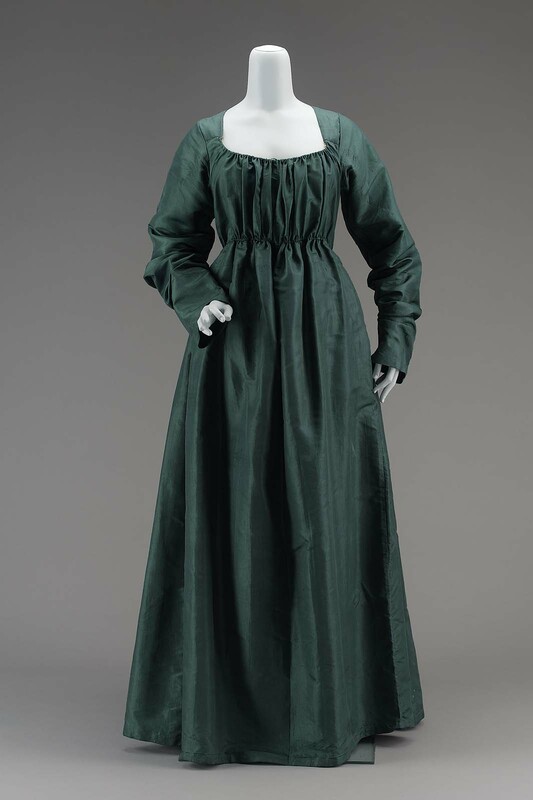 It's impossible to tell how the sleeves on the Shippensburg dress originally looked.